Sunset Cycles' Blog The latest news, products, and happenings from West Portland's premier bike shop! Everybody likes to save money…right? If you’ve been thinking about buying a new bike, now is your best opportunity to save some of your hard earned cash by taking advantage of our MASSIVE red tag sale, starting today! We’re blowing out bicycle inventory, and you stand to profit: Save 10%, 20%, 30%, and even 35% on selected bikes. If you’re just looking for new apparel or cycling accessories, you’ll save there, too! Take 10% off everything else in the shop (excludes 2015 bikes and service labor & parts). Stop in today and look for the RED TAGS…your road signs to savings! Located on Portland’s west side; our locally owned, full service bike shop carries some of the best products from the finest brands. We work with the largest and best suppliers in the industry, keeping you up to date with the latest trends and technology. 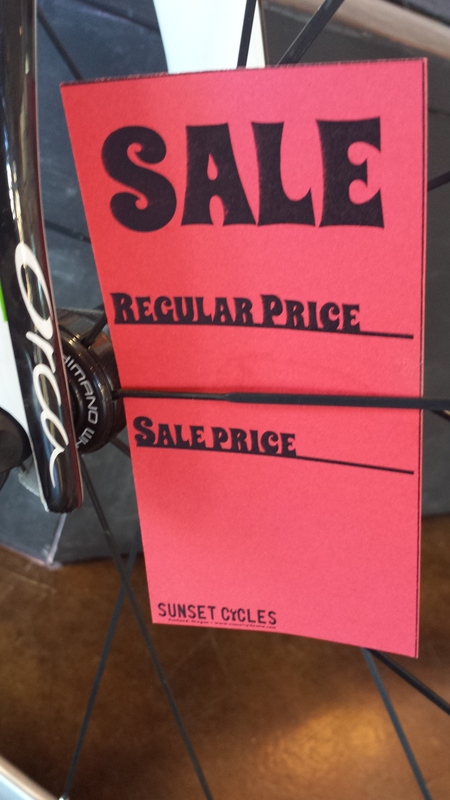 Sunset Cycles can provide you with all of your cycling needs.